But Can Your AI Recognize Slugs? The common garden slug is a mystery. Observing these creatures as they slowly emerge from their slimy lairs each evening, it’s hard to imagine how much damage they can do. With paradoxical speed, they can mow down row after row of tender seedlings, leaving nothing but misery in their mucusy wake. To combat this slug menace, [Tegwyn☠Twmffat] (the [☠] is silent) is developing this AI-powered slug busting system. The squeamish or those challenged by the ethics of slug eradication can relax: no slugs have been harmed yet. So far [Tegwyn] has concentrated on the detection of slugs, a considerably non-trivial problem since there are few AI models that are already trained for slugs. So far, [Tegwyn] has acquired 5,712 images of slugs in their natural environment – no mean feat as they only come out at night, they blend into their background, and their slimy surface makes for challenging reflections. The video below shows moderate success of the trained model using a static image of a slug; it also gives a glimpse at the hardware used, which includes an Nvidia Jetson TX2. [Tegwyn] plans to capture even more images to refine the model and boost it up from the 50 to 60% confidence level to something that will allow for the remediation phase of the project, which apparently involves lasers. Although he’s willing to entertain other methods of disposal; perhaps a salt-shooting turret gun? This isn’t the first garden-tending project [Tegwyn] has tackled. You may recall The Weedinator, his 2018 Hackaday Prize entry. This slug buster is one of his entries for the 2019 Hackaday Prize, which was just announced. We’re looking forward to seeing the onslaught of cool new projects everyone will be coming up with. If smartwatches and tiny Bluetooth earbuds are any indications, the future is with wearable electronics. This brings up a problem: developing wearable electronics isn’t as simple as building a device that’s meant to sit on a shelf. No, wearable electronics move, they stretch, people jump, kick, punch, and sweat. If you’re prototyping wearable electronics, it might be a good idea to build a Smart Internet of Things Wearable development board. That’s exactly what [Dave] did for his Hackaday Prize entry, and it’s really, really fantastic. [Dave]’s BodiHub is an outgrowth of his entry into last year’s Hackaday Prize. While the project might not look like much, that’s kind of the point; [Dave]’s previous projects involved shrinking thousands of dollars worth of equipment down to a tiny board that can read muscle signals. This project takes that idea a bit further by creating a board that’s wearable, has support for battery charging, and makes prototyping with wearable electronics easy. You might be asking what you can do with a board like this. For that, [David] suggests a few projects like boxing gloves that talk to each other, or tell you how much force you’re punching something with. Alternatively, you could read body movements and synchronize a LED light show to a dance performance. It can go further than that, though, because [David] built a mesh network logistics tracking system that uses an augmented reality interface. This was actually demoed at TechCrunch Disrupt NY, and the audience was wowed. You can check out the video of that demo here. Readers of a certain vintage will remember the glee of building your own levels for DOOM. There was something magical about carefully crafting a level and then dialing up your friends for a death match session on the new map. Now computers scientists are getting in on that fun in a new way. Researchers from Politecnico di Milano are using artificial intelligence to create new levels for the classic DOOM shooter (PDF whitepaper). While procedural level generation has been around for decades, recent advances in machine learning to generate game content (usually levels) are different because they don’t use a human-defined algorithm. Instead, they generate new content by using existing, human-generated levels as a model. In effect they learn from what great game designers have already done and apply those lesson to new level generation. The screenshot shown above is an example of an AI generated level and the gameplay can be seen in the video below. The idea of an AI generating levels is simple in concept but difficult in execution. 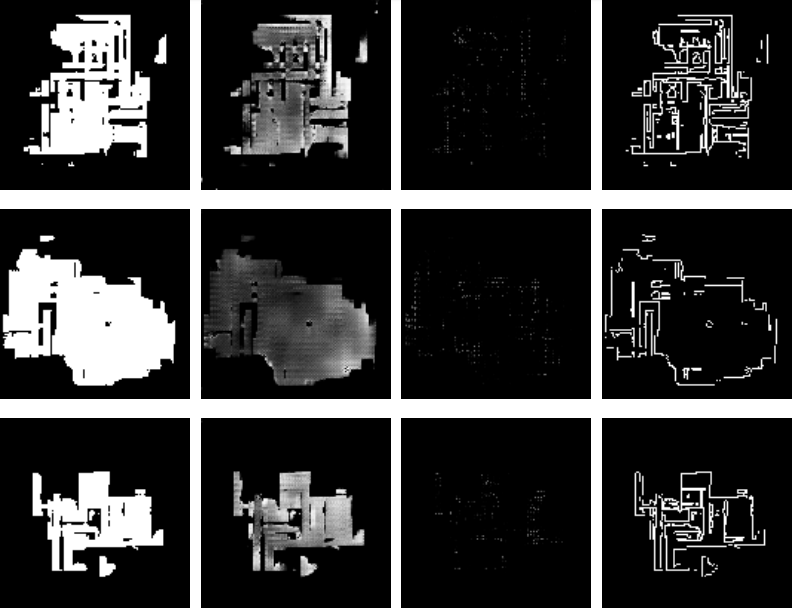 The researchers used Generative Adversarial Networks (GANs) to analyze existing DOOM maps and then generate new maps similar to the originals. GANs are a type of neural network which learns from training data and then generates similar data. They considered two types of GANs when generating new levels: one that just used the appearance of the training maps, and another that used both the appearance and metrics such as the number of rooms, perimeter length, etc. If you’d like a better understanding of GANs, [Steven Dufresne] covered it in his guide to the evolving world of neural networks. While both networks used in this project produce good levels, the one that included other metrics resulted in higher quality levels. However, while the AI-generated levels appeared similar at a high level to human-generated levels, many of the little details that humans tend to include were omitted. This is partially due to a lack of good metrics to describe levels and AI-generated data. We can only guess that these researcher’s next step is to use similar techniques to create an entire game (levels, characters, and music) via AI. After all, how hard can it be?? Joking aside, we would love to see you take this concept and run with it. We’re dying to play through some gnarly levels whipped up by the AI from Hackaday readers! It’s that time of year again, and with Halloween arguably being the hacker’s perfect holiday, we’re starting to see a tick up in projects with a spooky theme. Most seem to do with making some otherwise tame Halloween decorations scarily awesome, but this is different — using artificial intelligence to search for ghosts. It seems like [Matt Reed]’s “DeepWhisper” project is meant to be taken as light-hearted fun for the spooky season, but there may be a touch of seriousness to his efforts to listen in on ghostly conversations. The principle behind this is electronic voice phenomena (EVP), whereby the metabolically and/or dimensionally challenged are purported to influence electronic systems, resulting in heavily processed audio clips that seem to have a whispered endearment from the departed or a threat from a malevolent spirit. DeepWhisper takes this a step further by using a Raspberry Pi to feed audio into the Google Cloud Speech API for analysis. If anything is whispered in one of the 110 or so languages Google knows, it’ll get displayed on a screen. [Matt] plans to set DeepWhisper up in the aptly-named Butchertown section of Nashville and live-stream the results next week. It’ll be interesting to see what Google’s neural network makes out of the random noise it will probably only ever hear. And [Matt] is planning on releasing his code for all to see, so there may be some valuable cloud techniques to learn from DeepWhisper. But in the unlikely event that he does discover ghosts, it’s nice to know you can have the tools and the talent to bust ’em. Neural Nets in the Browser: Why Not? We keep seeing more and more Tensor Flow neural network projects. We also keep seeing more and more things running in the browser. You don’t have to be Mr. Spock to see this one coming. TensorFire runs neural networks in the browser and claims that WebGL allows it to run as quickly as it would on the user’s desktop computer. The main page is a demo that stylizes images, but if you want more detail you’ll probably want to visit the project page, instead. You might also enjoy the video from one of the creators, [Kevin Kwok], below. TensorFire has two parts: a low-level language for writing massively parallel WebGL shaders that operate on 4D tensors and a high-level library for importing models from Keras or TensorFlow. The authors claim it will work on any GPU and–in some cases–will be actually faster than running native TensorFlow.